It is the walking I remember most clearly. It is the walking, and the muscle memory of it, the feeling of my feet inside my shoes and the ground underneath them, that allows me to remember other things about the places that—quite literally, it seems—etch themselves into me. I’m not sure I could come to love a place if I didn’t move through it. In Paris I wore familiar sandals that collected dust and dirt, as did my feet. It was hot. My skin was always warm and slightly dusty. I was calm in Paris, alone. Comfortable in my dusty warm skin. I walked for hours in that city. In crowded places and quiet ones. I was isolated by my very minimal French, but often welcomed with a cheery ‘Bonjour’ or ‘Bonsoir’. I listened to the language like one might listen to music. I bought very little in Paris, other than food and a couple of small gifts. I had only a small backpack with me. I was blissfully free of luggage; similarly, baggage. I walked through cemeteries, galleries, streets. Barely speaking, mostly listening, often lost. In Edinburgh, I wore lace up shoes I’d bought in Ireland. Comfortable but still stiff while I wore them in. They made a pleasant click on the wide footpaths of the New Town, and held steady on the cobblestones of the Old Town. 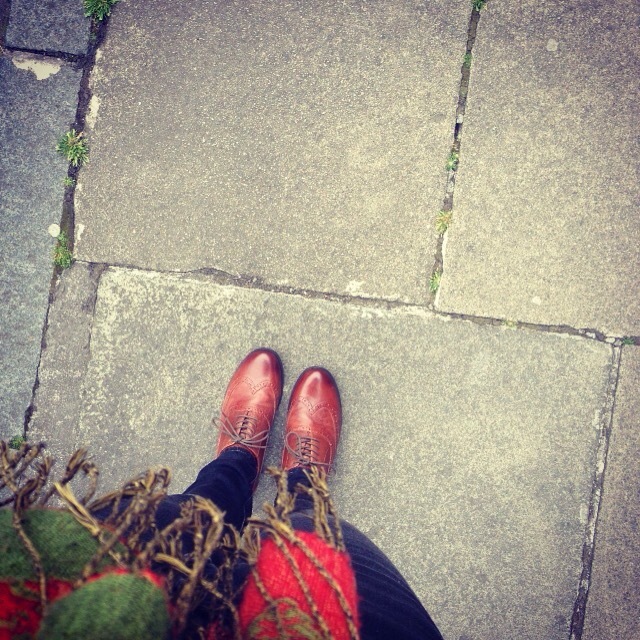 It was cold enough for a jacket and scarf in Edinburgh, though it was the beginning of summer. I was sad in Edinburgh, but somehow simultaneously so pleased to be there. I fell in love with the architecture in that city—with a beauty that seemed to embrace the idea of dark edges. It helped me to embrace my own shadowy outlines, to allow the sadness just to be. In the Scottish National Gallery I sat near a gallery tour group while the leader talked about a sculpture that looked from one angle like it was grimacing; from another, laughing. When the tour group moved on, I looked at the sculpture with a gallery security guard and another patron. I was the only one of the three of us who was tall enough to see the sculpture clearly from both angles. Only I could see the happy face too. In the New Town I found a cafe down some stairs, below street level. It had black and white checkered floor tiles. I sat in the window with a book, not really reading, and instead looking up at the street. The slightly acidic, but also sweet smell of coffee, and the melody of Scottish accents. I walked through galleries here, too, and castles and museums, and up a hill where I could look out over the city. I walked through my sadness, through my shadows. My feet were sore in Edinburgh, rather than dusty. My hair was wild, blown about by the wind. It is the walking that helps me remember these places now, and myself in them. The residual feeling of one step after another, the sense of moving slowly through space. It is the walking that has imprinted in my mind some kind of map of these cities: incomplete, hazy, highly individual, perhaps inherently unshareable, but undoubtedly precious. This entry was posted in Travel, Walking and tagged edinburgh, Paris, travel, walking, wandering by avocadoandlemon. Bookmark the permalink.